"He's played more golf than most people on the PGA tour!" said Trump of former President Barack Obama during an October campaign event in 2016. Two months earlier, while on the trail, he had told a crowd of supporters he was going to be too busy as president to play his favorite game. "I'm going to be working for you," he said. "I'm not going to have time to go play golf." Both Tom Kite, who has 37 professional victories, and Paul Goydos, who has 10, called him a "good player." And Fred Funk, who has 29 wins, said: "I think he's probably the best sitting president ever to play golf." But his swing, much like his presidency, is unconventional. Experts have faulted him for his backswing and the angle of his shoulder and elbow, but say that's all corrected by the time the clubface hits the ball. What matters most, they say, is that he's consistent and hits the ball with a "stable" clubface. 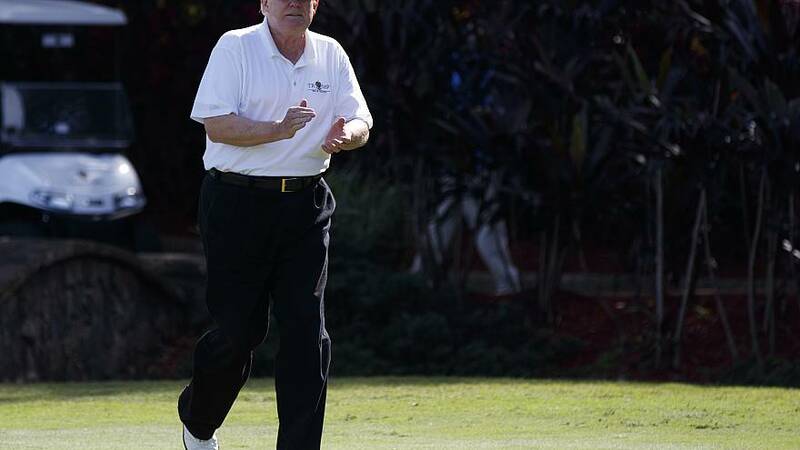 "He's not real long in terms of hitting it a long distance," Golf Digest reporter Jaime Diaz told NBC News, "but he's real straight and real consistent. So he's always in play." Diaz, who has played with Trump twice, said, "He just goes with what always has worked for him, and he trusts his instincts, which I think is one of his kind of mantras." Golf Digest ranked him the best golfing president in history. His handicap is in the single digits, though some question if it's legitimate. He's also the winner of 19 club championships — all at his own courses. "He looks at the three of us," said Immelt, "and says, 'You realize of course I'm the richest golfer in the world' — that's a comment — then gets a hole in one." "I actually said I was 'the best golfer of all the rich people,' to be exact," he said. Many of the president's most fervent supporters would be hard-pressed to pay those kind of fees. In interviews, he's said he wants golf to serve as a motivation for success. "I'd like to see golf be an aspirational game," he told the Golf Channel. He told Fortune magazine, "Let golf be elitist. When I say 'aspire,' that's a positive word. Let people work hard and aspire to someday be able to play golf. To afford to play it." For a populist president, it's not a populist message. "He doesn't apologize for that," Diaz said. "I think maybe he thought that's his brand." Way back in March 2016, when his ascension to the White House seemed unlikely, candidate Trump predicted in an interview with Gary Williams of the Golf Channel that a Trump presidency would be "very good for golf." "Because," said Trump, "very simply, I love the game."